Natural country charm and historical ambience: The country estate was built in the style of the Lower Rhine architecture and has a proud 200 year history.Enjoy with friends or on your own the tranquillity of the cosy courtyard laid out with historical pebble stone paving. Romantic access balconies lead into the rooms, which were renovated carefully in detail in 2005. 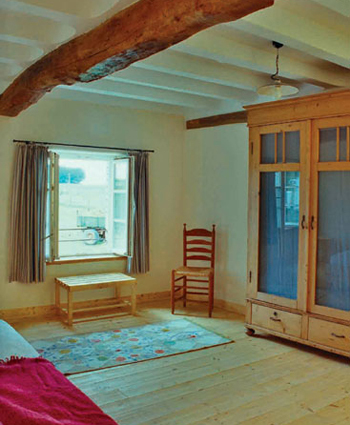 There are massive wooden beams, clay walls and hand made furniture which emphasise the rustic character, inviting relaxation and recuperation. Of course all rooms and the apartment are provided with modern comfort and communication technology: Bathroom with shower and WC, international satellite TV, internet access and telephone. The apartment has an additional bedroom. In our cosy breakfast room you will be able to enjoy a traditional German country breakfast which will set you up for the day’s activities. Close by you will find a wide range of restaurants offering an excellent variety of cuisine including local specialities. 7 comfortable double rooms, all en suite with telephone, international satellite TV and Internet access. You can use our cosy breakfast room as a launch or reading room. There is also a weather protected sitting area in the courtyard, which can be used for relaxation and socializing. Children free until age of 5, up to 12 years half price. On Saturdays and Sundays you may occupy the room up until 18.00. Dogs and pets are always welcome.